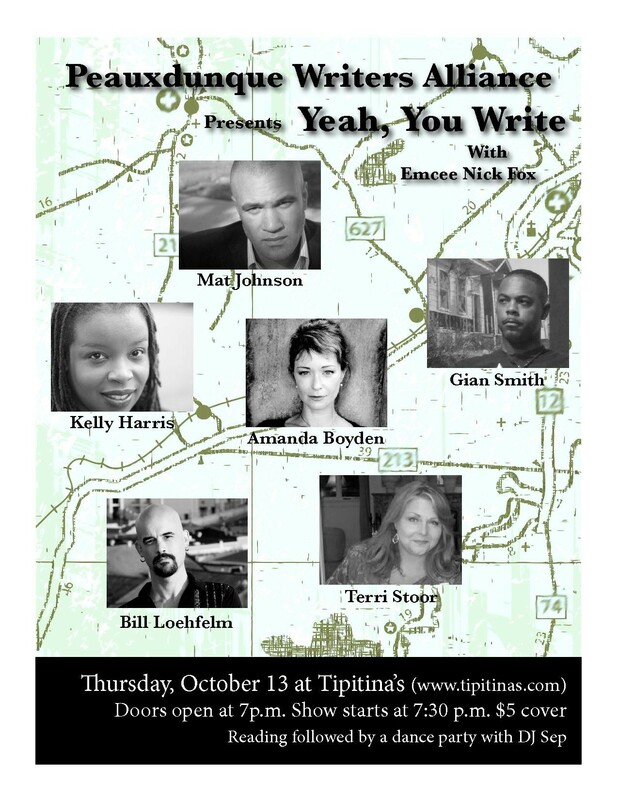 You can now purchase tickets online for the Yeah, You Write event, right now! Get yours ahead of time, before the room fills up. Mat Johnson, Amanda Boyden, Bill Loehfelm, Kelly Harris-DeBerry, Gian Smith, and Terri Stoor! Emcee’d by Nick Fox! Dance party following, with DJ Sep spinning the tunes! Drinks served up by Tip’s! This entry was posted in New Orleans, New Orleans Lit Events, Yeah You Write and tagged Amanda Boyden, Bill Loehfelm, Gian Smith, Kelly Harris-DeBerry, Mat Johnson, Nick Fox, Peauxdunque Writers Alliance, Terri S. Shrum, Terri Stoor, Yeah You Write by swampytad. Bookmark the permalink.